Fans of “The Young and the Restless” know Thad Luckinbill from the 11 years he portrayed J.T. Hellstrom. It was there that he met his wife, Amelia Heinle, who plays J.T.’s now ex-wife, Victoria Newman. But Thad has been keeping busy with other projects before, during and after his tenure on “YR,” most recently on The CW hit, "Nikita." This weekend you can catch him in the Hallmark Channel original movie “Keeping Up With the Randalls,” which premieres July 16 at 9/8c. I spoke with Thad recently about the movie, as well as some other projects. Celebrity Extra: One of the things I liked about “Keeping Up With the Randalls” is that although it’s a family film, it also has some sassiness to it. What were some things for you that initially drew you to the movie and to the character of Will? 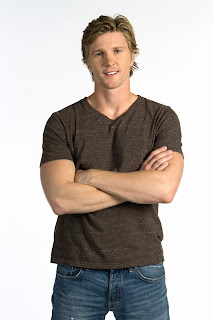 Thad Luckinbill: First off, I’ve known Kayla (Ewell, who plays Alicia) for a while, and I’ve always wanted to work with her, so that was a draw for me. Also, I like a lot of who Will is — in a big stretch of imagination it is kind of how I grew up and a little bit of my background in a way. I grew up in a small town with a lot of the focus on family, and playing sports was something I grew up with. I’m an outdoorsy guy, so all of that was just really fun, to be honest with you. When we were doing that stuff, I didn’t feel like we were working at all. There was a big, fun element to doing that, and also getting to work with Roma Downey and Marion Ross and everyone else was just a treat. CE: Were the rest of the actors excited to play all those sports and get to mess around outside a lot, or were some a little hesitant, like Kayla’s character, Alicia? TL: Everybody had a good time with the sports and the games. I had a blast the day we got to kayak on the lake. That kind of stuff is fun. Everybody just seemed like they were having a lot of fun doing it. It was a great cast. That whole cast got along so well. Hallmark does such a great job of getting people together and making it easy. It was just an easy shoot, and everybody got along really well and had a lot of fun together. CE: What are some qualities that Will possesses that you both have in common? TL: Obviously, the physical aspect. I grew up in a really loving family; my parents are still together. It’s kind of a small-knit community, so I brought a lot of that personal experience into that role because it just matched up so well. Will’s determination was something I decided to try to bring out, because I really do think he loves Alicia, and he really wants to make it work. That determination is definitely something that he and I share. CE: I was thrilled to see you featured last season on “Nikita” on the CW. Will we see your character, Nathan, next season? It was left kind of open for his return. TL: I think that’s yet to be determined. They were honest about it and told me that they weren’t sure exactly what to do with it, so that is why they left it open. It’s like anything, I think if the story’s right and it matches up to bring him back, then that would be great. I would love it. If it doesn’t, it doesn’t. I think it would be a good twist if they decided to bring him back. It was really a fun group to work with and a really cool show. I love how stylized that show is. I think that was what I was most impressed with. Not just the way they shoot, but the way it looks. It’s just a really pretty show. CE: I remember you had a pretty long run on the sitcom “8 Simple Rules.” What was it like working with a comic genius like the late John Ritter? TL: I know you shouldn’t say this, but that was my favorite job I ever had. Just because of John. I love sitcom work anyway, but to be able to work with that guy was pretty magical. He just had a way about him of making everybody feel good. He would come in the morning and just make everybody laugh. We’d be sitting down at the table waiting to read or start rehearsing, but he’d be talking to all the crew guys and the camera guys and the craft service guys, and making them laugh. He used his gift to make people feel good about themselves, and he was such a likable guy and so good at what he did. I’m sure when I look back at my career as I get toward the end of it, I’ll still have that at the top, because it was such a neat experience to work with him.